Is there a better alternative to SmartLedger? Is SmartLedger really the best app in Finance category? Will SmartLedger work good on macOS 10.13.4? SmartLedger's mission is to help you track income and expense without having to type numbers, dates, and names. SmartLedger makes use of pop-down lists that automatically grow as you use the program, so that you can click, rather than type, most of your information after your first few entries. Restore My Backup,a command under the SmartLedger Menu, now allows more flexibility for managing multiple ledgers and their backup files. The Import PayPal features have been revised and updated to conform to changes in the way PayPal offers business account history files for downloading. SmartLedger needs a rating. Be the first to rate this app and get the discussion started! SmartLedger is ideal for adding up randomly all those receipts you've stuffed into a grocery sack, awaiting your accountant's attention. Don't sort them out by hand -- just start with the first one and continue till you reach the bottom of the bag. Leave sorting and subtotaling to the program. Other uses: quick expense reports for your employer, monitoring a chancy budget. This simple program is flexible and won't lock you into account reconciliations. Enter only the transactions that are meaningful to you or your accountant. Reconcile when you want to, using the checkboxes and Accounts button. SmartLedger comes with sample entries. Play with the buttons to see what the program does. Then, when you're ready to start your own ledger, click "Remove Sample Entries" to get rid of the make-believe entries. Do you have a PayPal account? SmartLedger can import your PayPal account history automatically and give you the big picture on income/expense, subtotaled by category. For on-line vendors, an eBay fee and consignment calculator is included. To incorporate account history from other banks, use the Import Manually command under the SmartLedger Menu. You'll swear this application has artificial intelligence (indeed, it has intuition). Get to know the on-screen toggles and pointers, and you'll be entering transactions more quickly than you'd ever have thought possible. 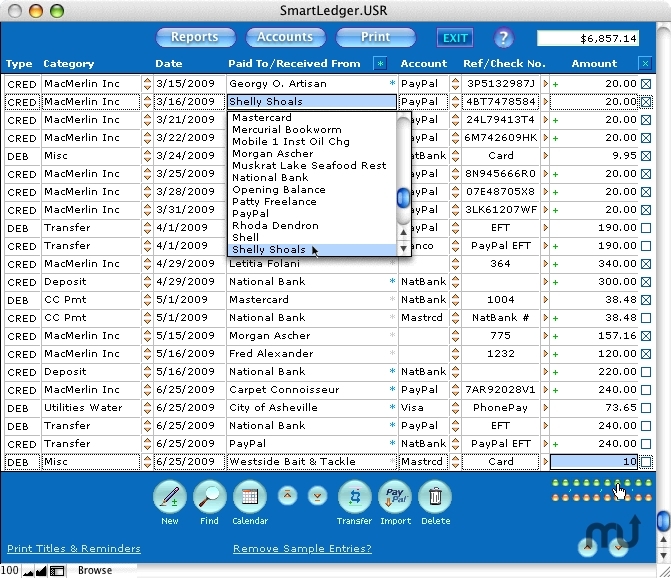 Built with FileMaker Developer as a standalone application, SmartLedger looks and behaves the same on both Windows and Mac operating systems. Three versions are available: Windows, Mac OS X, and Mac "Classic" OS 8/9.x. Improved appearance of the on-screen command buttons. Eliminated an unwanted blinking effect when browsing through records in the ledger. Amount and Total fields have been widened to accommodate larger numbers.